DNA methylation is the enzymatic addition of a methyl group to the carbon five prime position of a cytosine pyrimidine ring incorporated in a DNA sequence. This results in gene silencing that is maintained through cell division. De novo DNA methylation is associated with increased DNA methyltransferase 3b (DNMT3b) expression . As tissue hypoxia is a key component of inflammation, fibrosis and cancer, we propose here that hypoxic induction of DNMT3b plays a pivotal role in modifying epigenetic patterns key to the pathogenesis of hypoxic disease. To elucidate hypoxic regulation of DNMT3b, a 250 base pair region of the DNMT3b promoter, which includes a putative Hypoxia-Inducible Factor (HIF) - 1 Response Element (HRE), was inserted into a pGL3 luciferase vector. HeLa cells were then transiently transfected with the pDN- MT3b-Luciferase construct before being cultured in either hypoxic (1% O2) or normoxic (21% O2) conditions for 24 hours. After confirming hypoxic induction of luciferase activity, site-directed mutagenesis was used to mutate the putative HRE to assess its role in the hypoxic response. Interestingly, hypoxia induced a mean 2.56 ± 0.32 fold increase in luciferase activity suggesting that the DNMT3b promoter is hypoxia responsive. Mutation of the putative HRE significantly reduced hypoxic induction by 40.2% (P<0.01). These results describe for the first time that hypoxia induces DNMT3b promoter activity via a functional HRE in the 5’ untranslated region. This suggests that HIF is a critical mediator of DN- MT3b expression during hypoxic responses. Continued research could establish the link between hypoxia and its potential role in the epigenetic regulation of hypoxic disease. The field of epigenetics is on the rise, driven by the realisation that modifiers of chromatin are key regulators of biological processes in vivo. The three major classes of epigenetic effectors are DNA methylation, histone modifications (such as acetylation) and small noncoding RNAs (most notably microRNAs) . Figure 1. [A] Mechanism of DNA methylation: cytosine is converted to 5 methylcytosine with the addition of a methyl group to the 5th carbon of the carbon ring. DNMTs (1, 3a and 3b) catalyse this reaction. [B] The reversible changes in chromatin organisation that influence gene expression: genes are expressed (switched on) when the chromatin is open (active), and they are inactivated (switched off) when the chro- matin is condensed (silent). 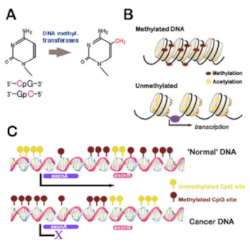 [C] DNA methylation directly impeding transcription factor binding. Image adapted from Rodenhiser, D. and M. Mann . The emphasis of this project is on DNA methylation, which occurs through the enzymatic addition of a methyl group to the carbon five prime position of a cytosine pyrimidine ring already incorporated in a DNA sequence. The resultant epigenetic modification is associated with gene silencing (Figure 1) and constitutes a stable mark that is maintained through continuous rounds of cell division (2). This addition of methyl groups is catalysed by the enzyme DNA Methyltransferase (DNMT), of which there are 3 forms described in humans, DNMT 1, 3a and 3b. The focus of this project is on DNA Methyltransferase 3b (DNMT3b) which has been shown to be involved in de novo methylations and has been seen to be increased in disease states (3). The majority of published epigenetic studies thus far have concentrated on the development and progression of cancer. It is emerging, however, that the epigenetic regulation of gene expression is important in many inflammatory and fibrotic diseases. For example, research involving patient lung tissue with idiopathic pulmonary fibrosis (IPF) has shown that there was loss of the fibroblast protein Thy-1 in areas of active fibrosis but it is expressed on fibroblasts in other areas of the lung. This loss of Thy-1 expression in the fibrotic foci of IPF lung tissue is the result of DNA Methylation of the Thy-1 promoter (4). The resultant decrease in Thy-1 expression has been linked to exaggerated fibrosis. However, to date, the processes controlling these changes are still not entirely clear. Work conducted in UCD has shown that hypoxia inhibits Thy-1 expression due to the promotion of Thy-1 promoter methylation (11). It is thus proposed that hypoxia may play a role in controlling gene expression via epigenetic regulation. The mechanism by which hypoxia regulates DNA methylation is unclear. Tissue hypoxia is a common occurrence in disease states and can induce epigenetic changes in the DNA of cells, which can be long lasting (6). It is generally accepted that hypoxia promotes Hypoxia-Inducible Factor (HIF) stabilisation within cells (7), thus making it our prime suspect in the association between hypoxia and changes in the epigenetic profile. In normoxic conditions, HIF-1 is continuously produced and, in the presence of metabolic iron (Fe2+) and oxygen, is continuously tagged for degradation through the Von Hippel Lindau protein (VHL)/Ubiquitin/Proteasome pathway (Figure 2). When oxygen becomes limiting, prolyl hydroxylase is inhibited and HIF-1 accumulates. After translocation and combination with the constitutive HIF-1 in the nucleus, the transcription factor binds to hypoxic response element (HRE) sequences to upregulate a number of downstream genes involved in tissue recovery, such as: EPO (erythropoetin) resulting in erythropoiesis, VEGF (vascular endothelial growth factor) leading to angiogenesis and glycolytic enzymes e.g. lactate dehydrogenase involved in anaerobic metabolism. In normal adaptive responses (for instance following ischaemic injury), these pathways are essential to enable tissue recovery. In the case of chronic inflammation however, maladaptive responses may significantly contribute to disease progression. As previously mentioned, there is evidence to support the hypothesis that epigenetic changes occur in fibrosis, however, the processes controlling these changes are still unclear. Research performed in the fibrotic kidney has shown links between increased methylation in fibroblasts and increased fibrosis (8). Interestingly, our laboratory has also similarly demonstrated increased global hypermethylation in primary lung and cardiac fibroblasts when they are exposed to hypoxia(11). Furthermore, we have shown increases in DNMT3b expression at both the mRNA and protein level in human primary lung fibroblasts cultured in hypoxic conditions (11). Investigation of the DNMT3b DNA sequence, revealed a putative HRE within the 5’ untranslated region (5’ UTR). We thus propose that it is hypoxia induced HIF binding to this putative HRE which increases the expression of DNMT3b. Tissue hypoxia is a consequence of inflammatory cell infiltration, tissue damage and microvascular disruption and is a key component of inflammation, fibrosis and cancer. This hypoxic induction of DNMT3b may play a pivotal role in modifying epigenetic patterns key to disease pathogenesis, through its permanent effects on cell phenotype and their progeny post methylation. To use site-directed mutagenesis to mutate the putative HRE within the DNMT3b promoter and hence test its functionality and assess its role in the hypoxic regulation of DNMT3b expression. The pGL3 Luciferase Reporter Vectors provide a basis for the quantitative analysis of factors that potentially regulate mammalian gene expression. The assay of this genetic reporter is rapid, sensitive and quantitative. The reporter gene and the gene of interest are placed in the same DNA construct to be inserted into the cell or organism. This is usually in the form of a circular DNA molecule called a plasmid. A cloned 250 base pair (bp) fragment of the DNMT3b promoter (pDNMT3b), which includes the putative HRE (Figure 3), was excised from the pCR4 TOPO Vector using restriction enzymes (XhoI & HindIII) and subsequently underwent electrophoresis on a 1% agarose gel. Upon visualisation with a UV Transilluminator, the identified 250bp DNMT3b fragment was extracted from the gel using a Gel Extraction Kit (Qiagen, cat # 28704). Finally, it was ligated into the XhoI & HindIII sites of a pGL3 Luciferase Vector (Promega, cat # E1751). Figure 3. The pDNMT3b-Luciferase Vector/Construct. Hypoxia induces HIF-1 transcription factor binding to the HRE, resulting in expression of the Luc+ gene and hence luciferase production. (p300: EIA binding protein p300; CBP: CREB-binding protein; HIF: Hypoxia Inducible Factor; PHD: prolyl hydroxylase; FIH: factor inhibiting HIF). Transcription of Luc+ gene (Figure 3), which ultimately produces luciferase. Luciferase catalyses a bioluminescent reaction to produce quantifiable amounts of light. This light is directly proportional to the amount of luciferase produced and hence allowing us to accurately measure DNMT3b promoter activity. HeLa (human cervical epithelial cancer cells) cells were transiently transfected with the pDNMT3b-Luciferase vector using FuGENE HD (Promega, cat # E2311) in 12-well cell culture plates. HeLa cells were used because of their high transfection efficiencies. A FuGENE HD:DNA Ratio of 3:1 was used (3.3μl FuGENE HD:1.1μg DNA). Transfection was carried out in antibiotic and serum free medium (Modified Essential Medi- um, Gibco, cat. # 31095), supplemented with 10% FCS (Gibco, cat. #10270) and penicillin/streptomycin (Gibco, cat. # 15140) diluted 1:100). After five hours, each well of transfected cells was split equally into two wells of separate 24-well cell culture plates; this ensured identically transfected cell populations. Following an overnight incubation of both 24-well cell culture plates in normoxia (21% O2), one plate was then placed in hypoxic conditions (1% O2) while the other was left in normoxia (21% O2). The duration of this incubation was 24 hours. After 24 hours, each well of cells was lysed with 40μl of Passive Lysis Buffer (Promega, cat # E1941). The lysate from each well was then transferred to separate microcentrifuge tubes and vortexed for 15 seconds followed by centrifugation at 12,000 x g for a further 15 seconds. 10μl of this ‘processed’ lysate was pipetted into 50μl of Luciferase Assay Reagent (Promega, cat # E1500). The readings were taken using a GloMax 20/20 Luminometer (Promega, cat # E5311). A 10 second measurement read for luciferase activity was used. Results were expressed as fold induction, i.e. the ratio of normalised luciferase activity of transfected HeLa cells in normoxia to those in hypoxia. Site-directed mutagenesis was used to mutate the putative HRE within the pDNMT3b-Luciferase vector. Two cytosine bases within the putative HRE were replaced with adenine bases (Figure 6). The mutant vectors (∆HRE) were sent for Sanger DNA sequencing (Source Bioscience) to con- firm the presence of the mutation. Western Blot was performed on HeLa cells that underwent a 3-day time course in hypoxia (1% O2). Nuclear proteins were extracted using a Nuclear Extraction Kit (Thermo Scientific, cat # 78833), and quantified using a BCA Protein Assay Kit (Thermo Scientific, cat # 23227). They were then run on a 10% SDS-PAGE gel and transferred onto a PVDF membrane (Immobilon-P Transfer Membrane, Millipore, cat.# IPVH00010). The PVDF membrane was subsequently blocked for one hour using blocking buffer (2.5g dry milk (Fluka, cat.# 70166) in 50ml TBS-0.25% Tween (Tris saline buffer with 0.25% Tween pH 7.8) with 1ml of goat serum on a rotating holder to reduce non-specific binding to the membrane. Following this, the PVDF membrane was then incubated for another two hours with 8 μL (1:500) of mouse monoclonal anti-HIF-1 antibody. After washing with TBS-0.25% Tween for three times, of ten minutes each, the PVDF membrane was exposed to 0.5 μL (1:10,000) of Horseradish Peroxidase (HRP) - Conjugated anti- mouse IgG and visualised by chemiluminescence using HRP substrate (Supersignal Wes Pico Chemiluminescent Substrate, Pierce Biotechnology, cat.# 3480). 2μL (1:2,500) of anti-a-Tubulin anti- body was used as the a-Tubulin loading control. Five separate experiments (n=5) were repeated to assess the fold induction of luciferase activity in hypoxia. A further twelve experiments were conducted to determine if the hypoxic induction of luciferase expression was HRE dependent. Results were expressed as means + SEM (standard error of the mean). Differences between groups were tested for statistical significance using the Student’s t-test. Prior to this, the data was assessed for Gaussian distribution. A P value of 0.05 (P< 0.05) was used to determine statistical significance and were two-sided. The analysis was performed with GraphPad Prism 5 Software (GraphPad Software Inc., San Diego, CA). To ensure that HIF-1 is stabilised when HeLa cells are placed in hypoxic conditions, we cultured them in hypoxia (1% O2) over a three day time course. As expected, Western blotting analysis (Figure 4) showed stabilisation and accumulation of HIF-1 from Day 1 onwards. This confirms the hypoxia-induced upregulation of HIF-1 in the HeLa cells used by this group. Figure 4. Western blotting analysis showing stabilisation and ac- cumulation of HIF-1 protein in HeLa cells incubated in hypoxic conditions (1% O2) for 1, 2 and 3 days. -Tubulin was used as a loading control in normoxic conditions (21% O2); n=1. As the graph clearly illustrates (Figure 5), luciferase expression was induced by hypoxia, indicating that the DNMT3b promoter is hypoxia responsive. This is represented by a mean 2.98 fold induction of luciferase activity (and hence DNMT3b promoter activity) observed after a 24 hour incubation of transfected HeLa cells in hypoxia (1% O2). Figure 5. 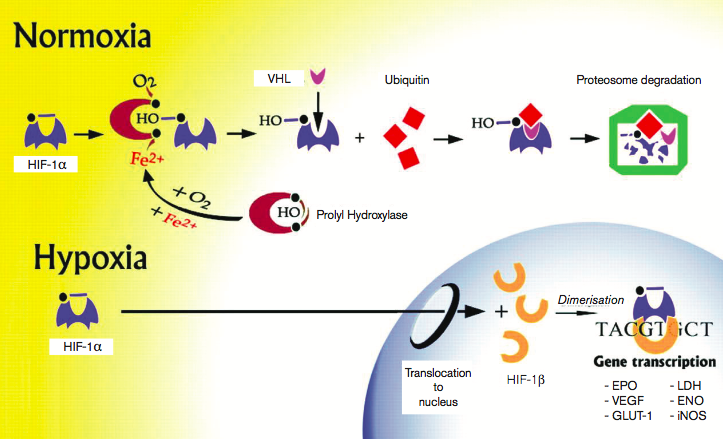 Luciferase expression was induced by hypoxia. Comparison of luciferase activity in HeLa cells transfected with a pD- NMT3b luciferase vector in both normoxic (21% O2) and hypoxic (1% O2) conditions after 24 hours incubation. (Fold induction = the ratio of normalised luciferase activity of transfected HeLa cells in normoxia to those in hypoxia). (*P < 0.05). The values represent means ± SEM for n=5 (representing the 5 pairs – one set of normoxic and hypoxic – of HeLa cells that were compared after being placed in their respective conditions. It was now established that the pathway responsible for hypoxic induction of DNMT3b promoter activity was intact in the transfected HeLa cells. Whether this putative HRE was functional, however, remained unclear. This hypothesis was tested by using site directed mutagenesis to mutate the putative HRE within the pDNMT3b- Luciferase vector to show that this putative HRE is indeed functional in the DNMT3b gene. To create the mutant, two cytosine bases within the putative HRE were replaced with adenine bases (Figure 6). This mutation specifically disrupts transcription factor binding sites on the putative HRE. Bioinformatic analysis confirmed that this mutation would block HIF binding with minimal disruption to other putative binding sites in neighbouring regions of the sequence. Figure 6. Site-directed mutagenesis was used to mutate the putative HRE within the pDNMT3b-Luciferase vector; two cytosine bases within the HRE were replaced with adenine bases. After confirming the presence of the mutation through the use of DNA sequencing, identical hypoxic luciferase reporter assays were repeated in cells that were transfected with the wild type pDNMT3b-Luciferase vector or the mutant vector alone. It was observed that after a 24 hour incubation period in hypoxic conditions (1% O2), a mean 2.56 (95% CI: 0.34-1.72, t=3.11, P<0.01) fold induction of luciferase activity (and hence DNMT3b promoter activity) was observed for HeLa cells transfected with the wild-type pDNMT3b-Luciferase vector. For HeLa cells transfected with the mutant vector only a mean fold induction of 1.53 ± 0.10 was seen (Figure 7). Mutation of the putative HRE significantly reduced the activity of the DNMT3b promoter by 40.2%. Figure 7. Hypoxia induced DNMT3b promoter activity is depend- ent upon a functional HRE in the 5’UTR. Comparison of luciferase activity in HeLa cells transfected with a wild type and mutant pDNMT3b-Luciferase vector in hypoxic (1% O2) conditions after 24 hours incubation. (Fold induction = the ratio of normalised luciferase activity of transfected wild type HeLa cells versus transfected mutant HeLa cells in hypoxia). (**P < 0.01). The values represent means ± SEM for n=12 (representing the 12 pairs of HeLa cells – one with wild type DNA, one with mutant DNA - that were compared after being placed in hypoxic conditions (1% O2). Based upon this mutational analysis of the HRE, we are confident that hypoxia induced DNMT3b promoter activity is dependent upon a functional HRE in the 5’ UTR of the DNMT3b gene and that HIF is likely to be a principal regulator of its activity. This study illustrates for the first time that the DNMT3b gene contains a functional HRE in the 5’ UTR that is predominantly responsible for the hypoxic induction of DNMT3b promoter activity. And thus, we propose that HIF is a critical mediator of DNMT3b expression during hypoxic responses. It should be noted that further investigation into the residual activity of the mutant vector may also be warranted (see Continuing Experiments). Although the link between various disease states and hypoxia is evident, it is less clear how hypoxia contributes to disease progression. DNMT3b has the ability to change the methylation pattern of DNA in a cell. This alteration in the epigenetic profile is associated with, and can possibly drive, the pathogenesis of certain disease states. For example, in chronically hypoxic benign prostate epithelial cells (a characteristic feature of the aging prostate), there is a marked increase in DNMT3b expression. This can promote and maintain the expression of regulatory genes and adaptive pathways that instigate tumour development (9). Preliminary data from our laboratory has also shown this same increase of DNMT3b expression at the mRNA and protein level in human primary lung fibroblasts cultured in hypoxic conditions (11). With these new results, there is good precedent for continued research into this area, which could further establish the link between hypoxia and its potential role in the epigenetic regulation of hypoxic disease. Unlike genetic alterations, epigenetic modifications influencing gene expression are reversible, thus providing an area of therapeutic interest. Currently, there are inhibitors for DNA methylation available, for example: 5-aza-2’-deoxycytidine (Decitabine) which has been approved by the FDA for the treatment in myelodysplastic syndrome (10). Therefore, it is known that targeting DNA methylation is a viable treatment option in diseases. We thus propose that developing DNMT3b inhibitors to block ab- errant methylation or inhibiting HIF-1 activity may be novel therapeutic strategies for inflammatory and fibrotic diseases (E.g. Idiopathic Pulmonary Fibrosis) which also has important implications in the treatment of certain cancers. From this study it is clear that one of the principal regulators of DNMT3b expression during hypoxic culture is likely to be HIF. In order to confirm that HIF specifically induces DNMT3b promoter activity, it would be necessary to utilise a HIF-1 overexpression vector to over-express HIF-1 during normoxic culture. This would be done via a co-transfection scenario with the wild type or mutant vector. Results will be determined via luciferase analysis as carried out in this study. Challenge the hypoxic mutant with Mithramycin A (eliminates Sp1/Sp3 binding) to see if it abolishes residual mutant activity. Investigate the effect of Mithramycin A on endogenous DN- MT3b expression in cells that have been placed in hypoxic conditions. Challenge the hypoxia-induced DNMT3b response with SiR- NA (small, interfering RNA) that targets HIF. Si HIF induces the degradation of HIF RNA, preventing its translation. When cells are treated with Si HIF and placed in hypoxia, it is expected that there should be no increase in DNMT3b expression. This would corroborate well with the results of this study. I relish the challenge that all research demands, especially the need to think critically and adapt to diverse and rapidly changing situations. I was also eagerly looking forward to be further introduced into research. I believe some research experience is integral to giving me a better understanding of pathology and the path needed to generate new treatment or biomarkers. Ultimately, I hope this experience will help me become an even better clinician. However, when I initially decided to sign up for the UCD Summer Student Research Program, I was rather hesitant as I knew that the experience I would have was up to me as much as the supervisor I had and the research team I would be working with. As it turns out, I managed to find a project in an area I was interested in, and a supervisor, whom I had enjoyed lectures from previously. Both of these were crucial to making this project a success. Before the project began, I had huge concerns about not being able to produce results with the limited experience I had. Of course, all this was soon put to rest. Being able to work with and feel part of a research team has truly been an enjoyable experience. Everyone was both knowledgeable and friendly. This helped me to settle into the lab as I was both able to lean new techniques and grasp a thorough understanding of what I was doing. They took my “lower-level” input without any fuss, and even took the liberty to explain in detail any questions I had regarding laboratory techniques or the research itself. From this experience it is my opinion that the toughest part in research is not learning laboratory techniques. Contrary to popular belief, I think that’s the easy part. The invaluable skill, is knowing when it’s the right decision to continue and when to end experiments. There were many times during the course of the research that experiments would continue to fail. Being able to tell if this was a problem due to poor experimental design or a problem with the materials or techniques was something that I could not do. Only the insight of an experienced researcher could have known what the next best course of action was. With the above in mind, I’d like to especially thank Dr. John Baugh (supervisor) and Claire Robinson (Ph.D. Student) for their continued support, guidance and most importantly patience during this project. Their advice and counsel has been invaluable to its success and my excellent summer research experience. I am definitely considering doing more research down the line. Thanks also go out to all in the lab who put up with my silly questions and to Dr. Amanda McCann for making all this possible. Finally my appreciation goes out to the Pathological Society of Great Britain & Ireland for supporting me through the Undergraduate Bursary (UE 2011/04/38) which helped greatly to ease my burden on expenses this summer. Razvi ES. Conference Scene: Select Biosciences Epigenet- ics Europe 2010. Epigenomics. 2011;3(1):15-8. Plewa T, Jagodzinski PP. The role of mammalian DNA meth- yltransferases in the regulation of gene expression. Cell Mol Biol Lett. 2005;10(4):631-47. Rodenhiser D and Mann M. Epigenetics and human disease: translating basic biology into clinical applications. CMAJ, 2006. 174(3): p. 341-8. Sanders YY, Pardo A, Selman M, Nuovo GJ, Tollefsbol TO, Siegal GP, et al., Thy-1 promoter hypermethylation: a novel epigenetic pathogenic mechanism in pulmonary fibrosis. Am J Respir Cell Mol Biol, 2008. 39(5): p. 610-8. Rege TA, Hagood JS. Thy-1 as a regulator of cell-cell and cell-matrix interactions in axon regeneration, apoptosis, ad- hesion, migration, cancer, and fibrosis. The FASEB Journal. 2006;20(8):1045-54. Watson JA, Watson CJ, McCann A, Baugh J. Epigenetics, the epicenter of the hypoxic response. Epigenetics, 2010. 5(4): p. 293-6. Smith TG, Robbins PA, Ratcliffe PJ. The human side of hypoxia-inducible factor. British Journal of Haematology. 2008;141(3):325-34. Bechtel W, McGoohan S, Zeisberg EM, Muller GA, Kalbacher H, Salant DJ, et al., Methylation determines fibroblast activation and fibrogenesis in the kidney. Nat Med. 16(5): p. 544-50. Watson JA, Watson CJ, McCrohan AM, Woodfine K, Tosetto M, McDaid J, et al. Generation of an epigenetic signature by chronic hypoxia in prostate cells. Hum Mol Genet, 2009. 18(19): p. 3594-604. Kantarjian H, Issa JPJ, Rosenfeld CS, Bennett JM, Albitar M, DiPersio J, et al. Decitabine improves patient outcomes in myelodysplastic syndromes. Cancer. 2006;106(8):1794-803. LaManna JC, Chavez JC, Pichiule P. Structural and functional adaptation to hypoxia in the rat brain. J Exp Biol 207: 3163-3169, 2004.